The ALTAIR 4X Multi-Gas Detector measures up to four gases from a wide range of sensor options including LEL, O2, CO, H2S, NO2 and SO2. A rugged housing provides unsurpassed durability, including the ability to survive a 6 m drop test onto concrete. And with large, glove-friendly buttons and a high-contrast display, the ALTAIR 4X is easy to operate in any work environment, even low-light conditions. A full range of accessories is availabe. MSA XCell Sensors double the industry average, and are engineered using MSA's proprietary application-specific integrated circuit (ASIC) design. The sensors' controlling electronics is miniaturized and placed inside the sensor itself. The XCell Sensors - Superior stability, accuracy, repeatability and fast response characterize the new MSA XCell sensors. They are remarkably long-lasting and designed for an average life of more than four years. An end-of-sensor-life indicator gives advanced warning to user, eliminating service outages. Micro-electronics inside the sensor lead to faster response and calibration times. Built on Durability - The ALTAIR 4X Multi-Gas Detector for LEL, CO, H2S and O2 is as tough and functional as it looks. A rugged housing IP 67 (dust and water resistant) provides unsurpassed durability, including the ability to withstand a 6 m drop onto concrete. And with large, glove-friendly buttons and a highcontrast display, the ALTAIR 4X Multi-Gas Detector is easy to operate in any work environment, even low-light conditions. Powered by Performance - Toughness and durability aren't the whole story. The real strength of the ALTAIR 4X Multi-Gas Detector comes from new sensor technology. MSA XCell Sensors are designed for an average life of more than four years and are engineered using MSA's proprietary application-specific integrated circuit (ASIC) design. By miniaturizing the sensors' controlling electronics and placing them inside the sensor itself, MSA XCell Sensors offer superior stability under extreme environmental conditions, accuracy and repeatability. MSA XCell Sensors are a breakthrough in chemical and mechanical sensor design, enabling faster response and calibration times. With less time spent on calibration and bump tests, you save calibration gas, maintenance costs and, in turn, save money. But most importantly, in your industry, saving seconds on response time can also mean saving lives. Count on the ALTAIR 4X - Exclusive safety features like MotionAlert and InstantAlert make the ALTAIR 4X Multi-Gas Detector ideal for applications like confined space entry. The MotionAlert sensor activates when a user becomes disabled and motionless, quickly alerting others to the disabled user's location. And with a simple push of a button, the InstantAlert feature enables users to manually alert others to potentially hazardous situations. 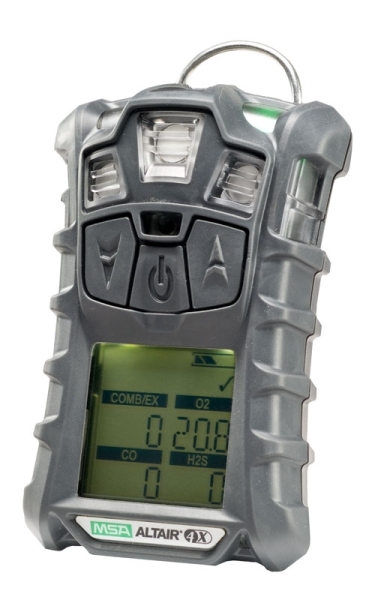 The detector comes with a full three-year warranty, so you can depend on the ALTAIR 4X Multi-Gas Detector to withstand the wear and tear that other portable gas detectors can't.